Frames in the landscape – and a walkthrough. After having drawn the very angular plan of last week, with the angles signifying the direction of the next ‘frame’ of excavation, as well as letting lines converge at the tower, to create a sort of perspective coherence with the tower as the vanshing point – all taking inspiration from the plans of Enric Miralles, I discussed said form with Anders and the conclusion was that it in some way becomes too much of an architecture in itself to fulfill its purpose – displaying the ruin. In order to do so, frames aligned with the geometry of the ruin itself would serve this purpose the best – this way the content becomes important rather than the frame – rather like when exhibiting something in a frame on a wall. The connections between said frames would then be simply the shortest possible route between them, never connecting at the corner of the frames – which would ruin the strict geometry and the idea of the ‘frame’ in the landscape. There was also the talk of paving materials. Where I have so far thought of the paths being made in crushed brick and the ‘frames’ being filled with whole bricks, like a ‘materialization’ of the frames, Anders pointed out that crushed brick or gravel much better fills out the gaps that the ruins walls would have, while the full bricks could be used for the paths and the walls surrounding the frames. Here comes the question again of which bricks. Contrast and complement are the keywords here. Rather than emulating the medieval bricks I think that a pattern such as the one we used at Randers tegl really gives counterplay to the ruin, but perhaps stands too much out in itself. In this case I want to brick to step to the background, letting the bricks of the ruin stand out. Really a clean concrete surface would be the most obvious way to do it, but I feel that the right bond with the right brick would lend something else to the place. It may still be the ultima bricks, as I felt that they have worked very well with the original bricks. Another option I have considered is the cut up bricks of herzog & demeuron at Vitra in Basel. The bond completely dissapears and they have a wonderful tactility, but I once again feel that they would draw too much attention to themselves. Subtlety is the word. A third material may be needed for the stairs and walkways around the site. This leads to another point. After returning to the site once again, during a veritable storm, I walked through my route as I had thought it out, and it appeared to me that it may be too cramped and not very natural. Almost walking back the way you came in several instances, the idea of following the flow of the landscape and the zig-zag movement should still be there, the idea of the tower as the centre definitely so, but another way of achieving it should be by movement of the body rather than a geometrical shape. I had the idea that perhaps the space between the tower and the adjacent building should be symmetrical with four stairs coming down, and perhaps even a glass sheet in the centre. Due to the tower being wider than the long house next to it, the stair towards the bridge would then be larger than the others. This would maintain the outside geometrical symmetry, but also show the significance of this being the first entrance that meets the visitor to the site – “this way in”. You would then enter the oblong space from the side, looking at the castle turning left to see the long axis of the room, with a light well at each end bringing light down upon a poster, you can read the one closest to you, but not the one at the other end. This will entice you to want to get to the other end to see it, but know that you will see it later on your journey. From walking out there I got the idea of going outside the castle wall at the corner tower, continuing up to the only window in the long eastern wall which I previously also had as a destination, but now using it both as a view hole and as a the entrance back into the castle. While walking outside the wall your view of the castle is completely blocked in the beginning, leading you to look out at the landscape, while contuing up the slope however the view opens again and this time you see much more than you do inside, because you’re at a higher vantage point and you’re looking from the outside in. Upon entering through the old window in the wall you stand in another smaller excavation site, that clearly shows the foundation of the previous castle of Erik Menved as well as the hole in the wall you just entered through. This staircase is very important. It mustn’t obscure the view and it must not be too massive. I am even considering a using ladders with a slight incline. This way you would be facing the view while walking down and seeing the old foundation as you reach the bottom. Next, turning around, an old door opening takes you out into the central courtyard space, where a path leads back towards the tower, whereupon walking down the stairs you once again stand in the excavated tower – but this time at the other end. After sitting on a bench looking at the light flowing down the tower, you exit again going up the last set of stairs, which ends right in front of a staircase to the left into one of the most interesting and intact spaces of the ruin – an old cellar. This is not excavated, but pointed out to you as interesting merely by the end of the staircase next to it. Having looked at this pace you continue on a path back out into the courtyard, finally arriving at a new excavation at the end of the western wing of the castle – the old kitchens. Here a staircase takes you down the hill to the outside wall, you turn left and you are in an excavated space into the hill. The incline of this hill is really signified by the excavation straight into it – the features of the old kitchen are also made much clearer by the clean surface that now surrounds this part. A path leads you on along the outside wall of the castle, the lowest point. At the end of the wall the path leads you over the castle wall. This takes you to the end of the castle exhibition and to the second act of the story. The viewing platform and building on the hillside got very positive response. This we agreed was a very similar thing to what was done when excavating in the site. Putting something foreign down in the landscape to show something. This Anders pointed out would be made even stronger by seperating it from the plane of the castle – and letting visitors walk there on a bridge. Another point to be made was that it should not be seen immediately when arriving via the bridge – it should be saved for last. I also felt that this idea of arriving from the landscape to explore the castle which has one main closed building at the tower where paths converge and then ending up in a totally different building which is focused on the landscape. Standing as a completely foreign object in brick cutting the hill in half and thusly making the slope of the hill more visible. 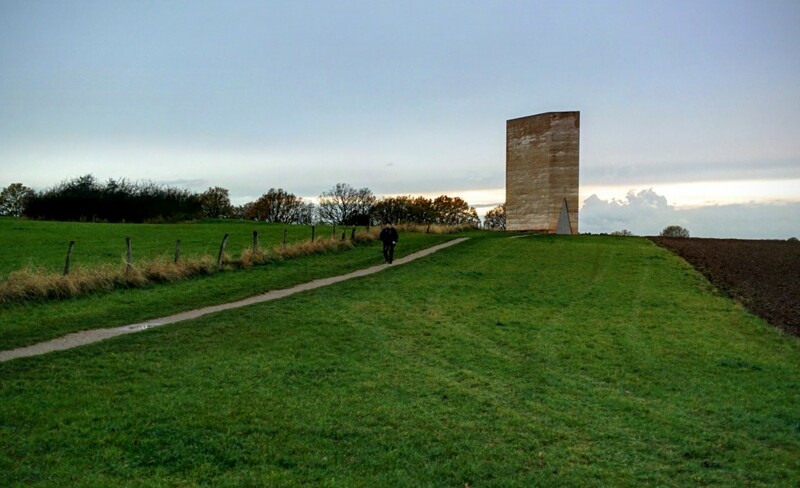 When looking at a hill it can be hard to discern how tall it is, just as it can be hard to see how large something is on a photograph or a drawing unless there is some point of reference like a person in the photo. 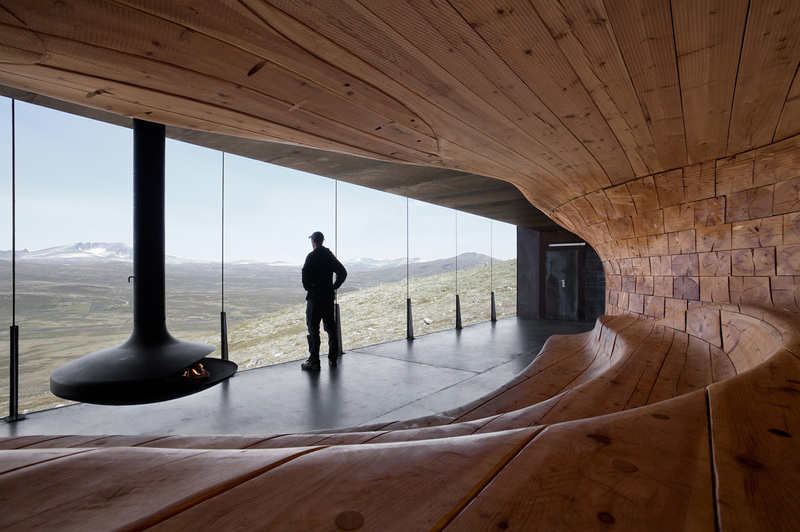 This building could have the same function for the hill, while at the same time being a place of calm where you can sit and observe the landscape. I think it would be fantastic if you could go inside and all you could see was the sea, sitting on seats following the topography of the landscape and with a fireplace. A good example of this which I will come back to is Snøhettas Reindeer pavillion. Another excellent is Bruder Klaus Feldkappelle which we just visited on the way back from our study trip at La Tourette. I have an idea for such a space, which came from the sketches on the bottom left on the drawing that is above this post, but I have yet to draw this newest iteration through, which includes a fireplace/double wall which will seperate the stair from the roof from the inside space and also hold the firewood for the fireplace. Fireplaces are often the alter of a house and the centre, but here the view will be the centre, but the fireplace will have a very prominent position and size on the side. Below are two examples that show the difference. 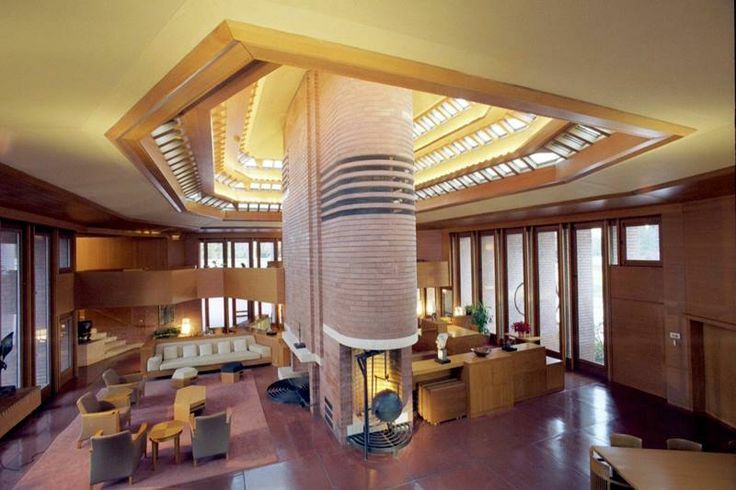 At the top is one of Frank Lloyd Wright’s famous fireplaces at Wingspread. Here the fireplace is at the centre of all circulation and the house is arranged around it. 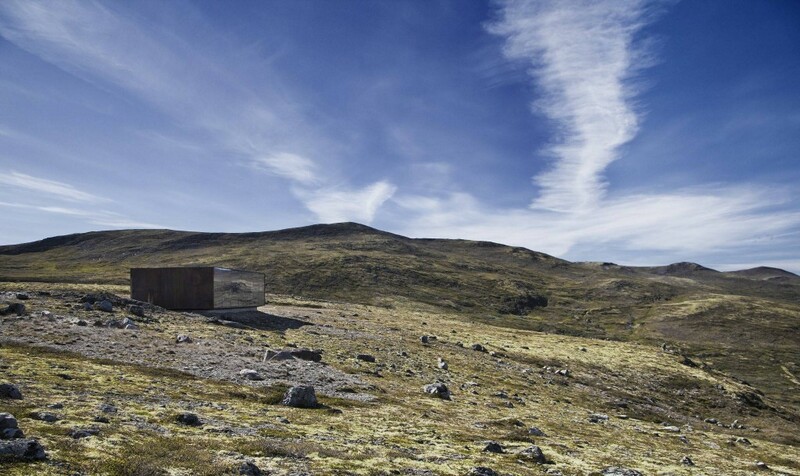 Below is the more recent reindeer pavillion in the norwegian wilderness by Snøhetta. Here the fireplace still holds an important position and is very sculptural, but it is set aside from the centre and is a feature in the room rather than the thing that defines the space. In my house I attend for the fireplace to land somewhere between these, with the circulation going around the fireplace like in Wingspread, but with the panoramic view as the main feature of the space. Wingspread – Frank Lloyd Wright for Herbert Johnson, 1937-39. The great hall. I am considering whether it would be a good idea to perhaps be even more radical and frame only the water?. Angle the window down towards the water, letting the whole space slant towards the water. As you walk down and take a seat you will be able to see some more of the landscape, but not before. This would frame a totally different experience than the one seen from the roof, but the experience of the view from inside will always be different in an indoor, warm space with the frame of the window dictating the direction of you gaze, than when outside in the elements, seeing everything at once. This is how I imagine coming to the building. Upon crossing over the castle wall and looking to the right the ground seems to continue out over the edge of the hill. A massive brick structure with the roof covered in the same crushed brick gravel as the excavation sites. A wall with a bench rizes up on the left side of the plateau. Even on this windy day with the rain silently falling, the wall feels warm. On a hot, sunny day this would seem to make sense, as it faces faces south-west but today something else must be afoot. After sitting on the warm bench taking in the view towards Rønde for a moment you decide to continue. At the edge of the plateau you look straight down 12 meters directly into the sea. Turning around the thick wall you follow a staircase down into the building. While walking down you catch a final glimpse of the ruin, before it dissappears and all you can see is brick. At the bottom of the staircase, you turn left on the landing and open the heavy metal door which is set back into the thick wall. You enter a room that appears to be much like a theatre with a steep incline – like one of the old west-end theatres of London, though here the angle corresponds to the hillside rather than to the cheap ticket you just bought. The view over the sea opens in front of you. Closest to you along the wall the stair contiunes down, with every second step contiuing across the room creating benches. While walking down you notice the fireplace at the front left of the room and see that the thick wall you just passed through was actually hollow and the reason it was hot was that it contained the chimney for the fireplace. It also contains shelving and firewood for the fireplace – light coming down from above. After enjoying the view for a few minutes you get back up from the bench and continue to the bottom of the stair where after passing the fireplace you turn left again, around the wall and walk a few meters before coming to another heavy door on your right – you open it, and in front of you lies a narrow path cut into the hill, following the landscape back under the bridge to the ruin. The wind feels much stronger and the rain seems colder, the air fresher. From here you can see that the coast line much resembles that of western jutland, with steep cliffs coming down and rocks at the bottom to secure the coast. This is it for now. My concerns now are mainly getting ready for the mid-crit and showing off these ideas. I have been drawing in plan and in a very graphic manner. At the end I want to have a section model all the way across the site in 1:100 showing the two buildings and the path on the outside of the wall. 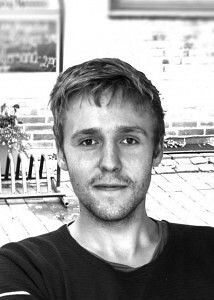 But for wednesday I am considering drawing an isometric drawing on top of the tracing paper drawing I have now. To start getting spatial again, to show depths of excavations, to show materials. This will be a totally different thing to the ‘Miralles’ plan I was planning on, but perhaps that has served its purpose – getting my thoughts and ideas to where they are now. Its still very much a liquid process where many things will change. But things are solidifying rapidly.